﻿“They don’t care about our health,” said the 34-year-old farmworker in muddy jeans who, like others, spoke on a first-name-only basis because he is in the country illegally. “They just care about the strawberries,” he said. According to the Post, “Organizers said they visited 25 farms last week and saw workers without protective covering at practically all of them.” While some employers themselves are trying to speed up production to save their crops, the pressures for workers are also economic—many of them couldn’t afford to lose a day of income, even if they wanted to stay inside. 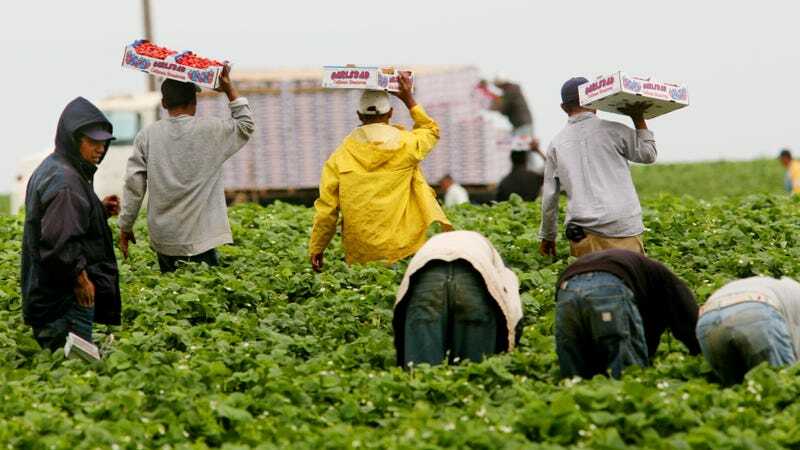 The already-existing exploitative conditions that California’s farmworkers labor under only serve to exacerbate the problem. For those who are undocumented, there often aren’t any other options to turn to outside of farm work. One worker told the Post that he wanted to see a doctor to ask about long-term effects of breathing in the smoke, “but I can’t afford it.” Even if they wanted to make an official claim, many of the workers primarily speak indigenous languages and according to the Post, none of California’s Division of Occupational Safety and Health staff, the state’s worker protection agency, speak Mixteco. As climate change worsens, there will only be more fires. For those who labor under some of the country’s most precarious conditions, there is little respite in sight.